The sky overhead was black, but the stars were beginning to fade. Soon the sun would rise and shed her pink light over the rugged landscape. The boulders on Mt. Kuchumaa would glow golden, and perhaps a morning mist would reveal itself in the valley between the mountain I was about to climb and the great Mt. Kuchumaa. As I swallowed my last sip of black tea, the leader of our group hike announced that it was departure time. Like horses at the racetrack when the gates open, the hikers in my group hit the trail with a jolt. It was barely daybreak, but they were already swiftly moving, chatting, and increasing their gait at a rapid pace. Having just rolled out of bed, I was still having difficulty focusing my eyes, let alone taking deep enough breaths to fill my lungs with oxygen. I huffed and puffed as the burn began to grow in my thighs. Already overheating, I stopped to remove my fleece shirt. By this time, the swiftly moving hikers were already far ahead and the slower few passed me as I tugged my shirt over my head. A few years ago this would have concerned me greatly. I had a thing about always hiking in the front. I was like a trail horse that had to lead the pack. 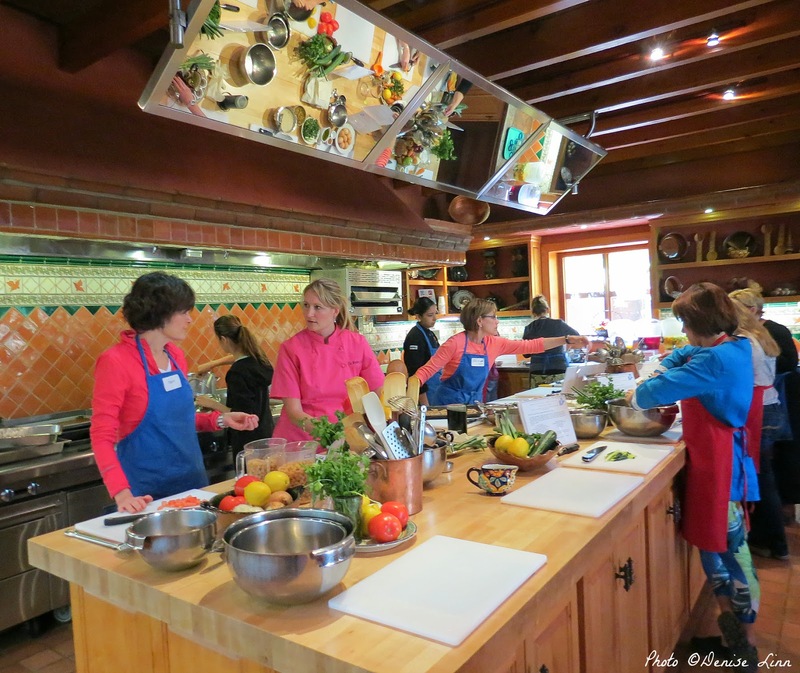 I’ve been going to Rancho La Puerta off and on for a number of years. 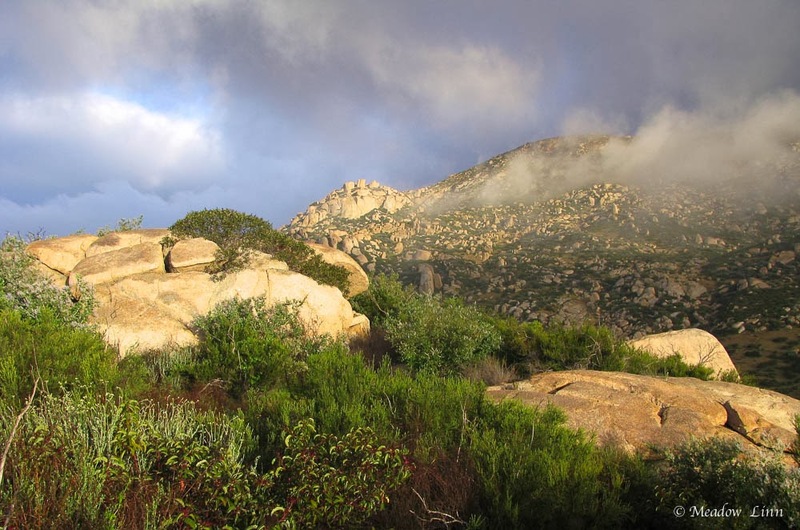 It’s a health and fitness spa in Baja with an emphasis on holistic wellness. 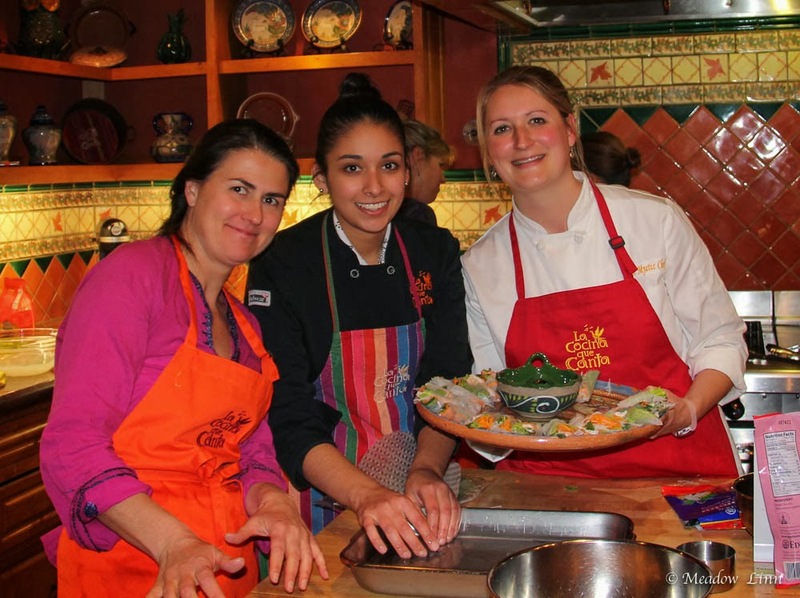 Last month I had the good fortune of spending a week as a guest chef at their cooking school, La Cocina Que Canta. 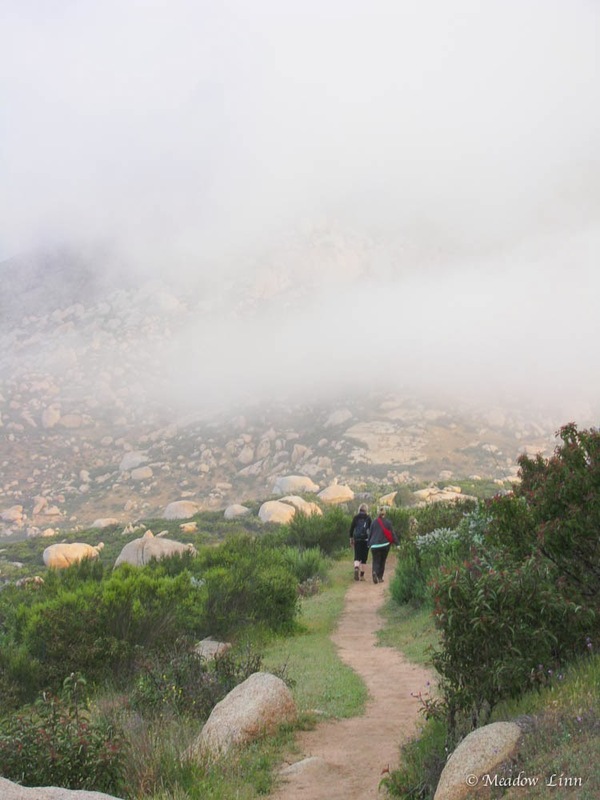 Days at the Ranch (as it’s fondly called) begin with early morning hikes. 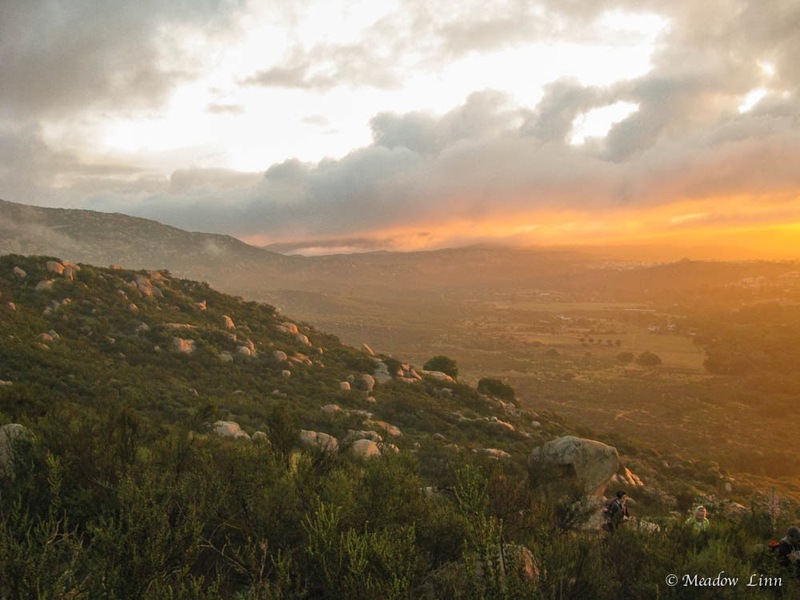 When I can drag myself out of bed before dawn, the mountain hikes are one of my favorite activities. Years ago, when I first started visiting the Ranch I would race up the mountain, always in front. The faster the people behind me hiked, the faster I would go. I privileged being in front over everything else. I subconsciously feared others would judge me if I dallied, so as I forged my way up the mountain, I rarely saw the beauty surrounding me. It took a number of years and a number of hikes before I realized no one would judge me if I walked more slowly. And even if they did, what would it matter? I’m not as fit as I used to be, so it’s much more difficult for me to be at the front now anyway; however, I’ve also learned a valuable lesson about slowing down. It’s not always necessary to race to the end, though there are times for that. There can be great value in being more mindful and reveling in the journey. 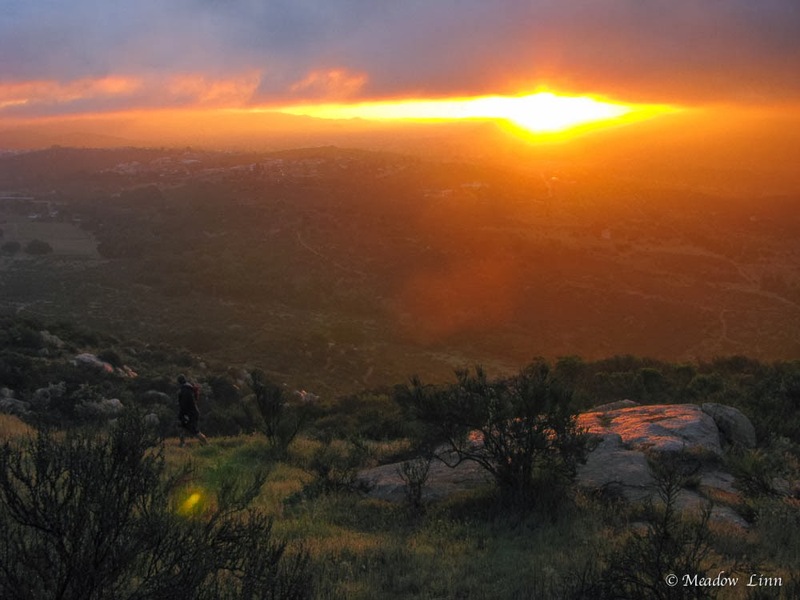 So, on that dark morning at Rancho La Puerta last month, instead of sprinting to the finish line, I got to breathe in my surroundings, feel the morning air on my cheek, and see the colors of the sunrise. For a while I hiked alone, which offered me an opportunity to think, which is something I don’t always make time for in my daily life. And when I met up with another hiker, we ended up having a delightful conversation about mindfulness, which seemed to be a nod from the Universe. Letting go of my need to be the lead trail horse was not easy; sometimes I still find myself worrying that others will think less of me, but when I see how enriched my life can be when I take time to go more slowly and savor what’s around me, I know I’m on the right path. Do you ever find yourself pushing so hard to reach a destination that you miss the journey? What do you do because you fear the judgments of others? What steps can you take to bring more mindfulness into your life? 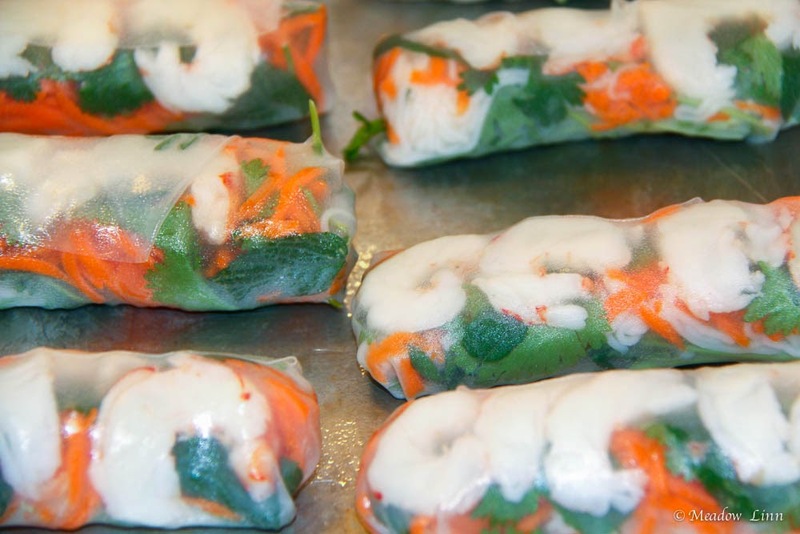 Nothing says, “spring isn’t too far away” quite like spring rolls! This is one of the recipes I taught in my cooking classes at La Cocina Que Canta, and they were a huge hit. Not only are they delicious, but also they’re fun to make. There is something meditative about rolling them. Use whatever vegetables you have on hand. Cucumbers, micro greens, pea shoots, bean sprouts, red bell pepper are all tasty additions. Flavored tofu can be used in place of the shrimp. As you work with each ingredient, take time to really see it. How does it look, smell, feel, sound, and taste? In a small bowl combine the garlic, peanut butter, and sugar using a fork. Slowly mix in the liquid ingredients until completely combined. Set aside. Bring a medium-sized pot (3 qt.) of salted water to a gentle boil. Poach the shrimp in the boiling water just until they turn pink, 1 to 3 minutes. Scoop the shrimp out with a slotted spoon. Transfer them to a colander and rinse with cold water. To save on time and cleanup, I like to combine tasks. So, although it might not be the most elegant cooking method, you can cook the rice noodles in the same water you used for the shrimp. Cook the noodles in the boiling water, 3 to 4 minutes (or according to the directions on the package) until just soft. Drain and rinse with cold water. Slice the shrimp in half lengthwise. Grate the carrots, wash and cut the lettuce, and assemble the herbs. I find that putting the fillings in small bowls and lining the counter with them assembly-line style is helpful when rolling the spring rolls. Lightly oil a baking sheet. 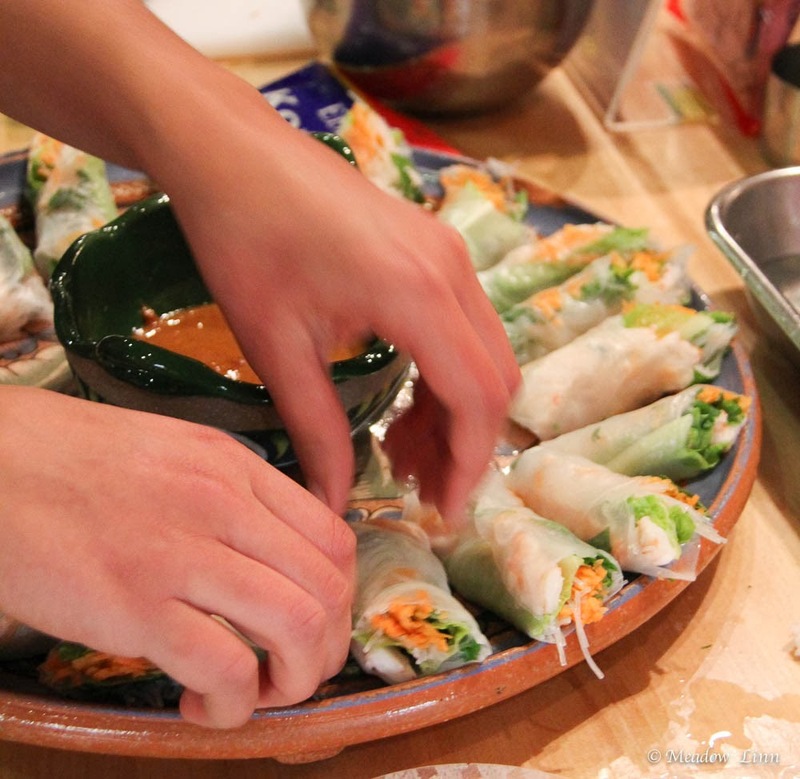 You won’t be baking these spring rolls, but it’s a good place to put them as you make them. The oil will keep them from sticking. Fill a pie plate with cool water and dip a rice paper wrapper into it. It should only take a few seconds to soften. Aim for about half-hydrated. If it’s too soft, the wrapper will become very sticky and will be hard to work with. If it’s not soft enough, you won’t be able to fold and roll. Carefully lay the softened rice paper wrapper on a plate. Place 2 to 4 shrimp halves—depending on their size—cut side down in the center of the rice paper wrapper. Top with the lettuce, carrots, noodles, and herbs. If the noodles become too sticky to work with, just run a little bit of cold water over them. 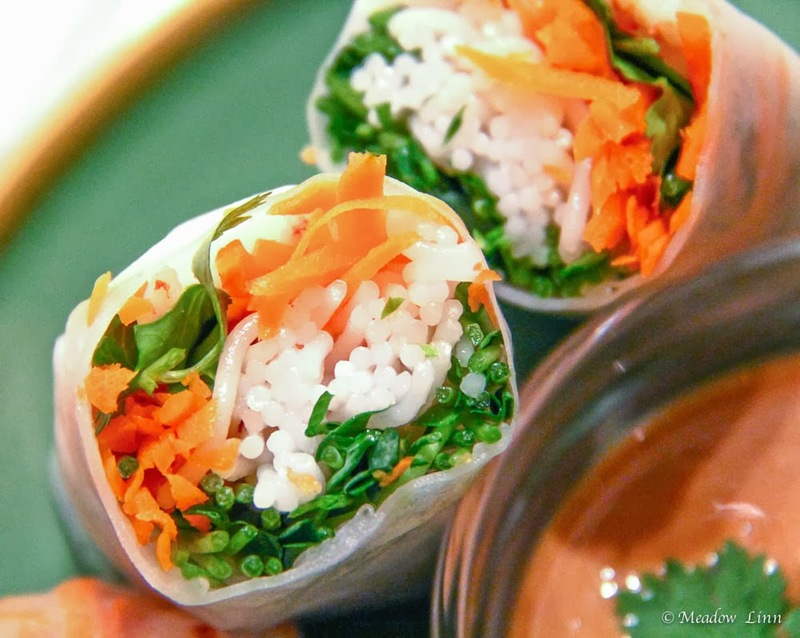 Like a burrito, fold in the two sides and then, starting with the side facing you, fold the rice paper wrapper over the top of the filling and roll away from you. This may take a bit of practice, but you’ll get it after one or two. Soak the next wrapper, and continue.